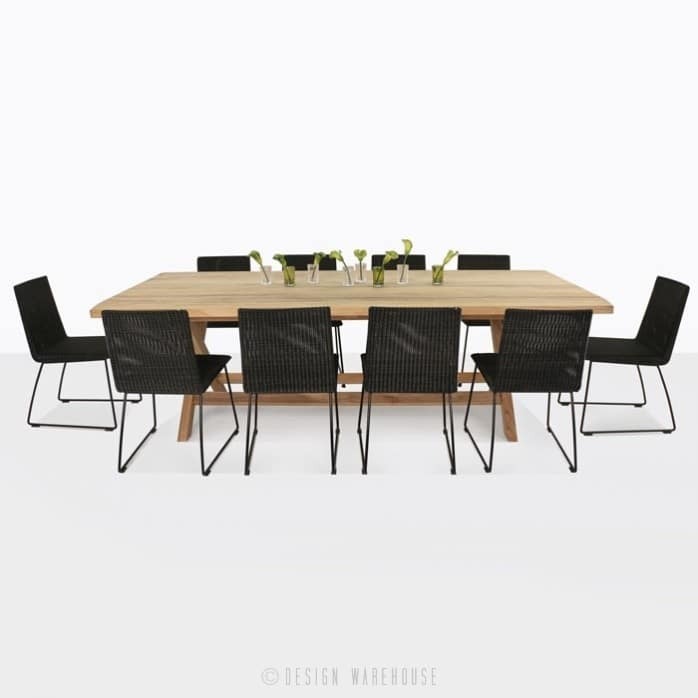 Sharp and stunning design with an organic feel perfectly describes this teak and wicker outdoor dining set featuring our Artisan table and Retro wicker dining chairs. The Artisan table, just like the name implies is a beautifully and carefully crafted table using a-grade teak and stainless steel. This table begs to be inspected up close, the tabletop has angled edges with exposed stainless steel rods making it a truly extraordinary design that is also subtle and strong. 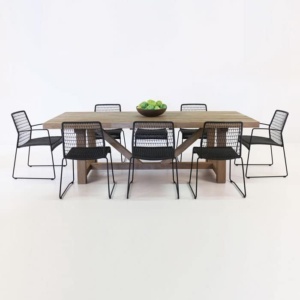 The Retro dining chairs are striking in black wicker and add a modern vibe that goes beautifully with the table. 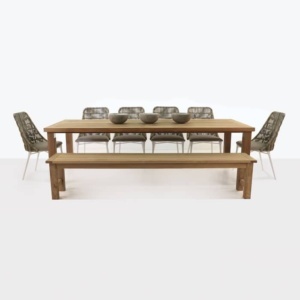 Ten people can fit comfortably around this dining table allowing you to host large dinner parties in comfort and style. You can also pair this table with many of our other outdoor dining chairs, we have so many options available. The a-grade teak dining table and chairs come fully assembled and are ready to be picked up or delivered. Call and talk with one of our sales team members today to learn more or visit our showroom to see and experience this table up close.